“I find his [Zuckerberg’s] comments disingenuous,” says Edwards speaking on New Zealand’s Morning Report, a radio show. “They actually didn’t have any systems to detect the events in Christchurch”. Edwards also had reservations about Zuckerberg’s claim that livestreaming is rarely used inappropriately, saying Facebook either didn’t have the numbers or wouldn't reveal them when he asked how many violent attacks, such as murder and sexual assault, have been livestreamed on its platform. Edwards says governments around the globe need to come together to force digital platforms to find a solution to harmful content, and noted Australia’s recent attempt is a good way to get tech giants’ attention. “Facebook can’t say it’s just a platform anymore,” Edwards says. “They have enabled their service to be manipulated by Russian trolls to influence the US elections and have been responsible for appalling content that set the preconditions for genocide in Myanmar. Australian professor David Watts also labelled Zuckerberg “disingenuous”, telling AdNews his call for governments to take an active role in regulating Facebook is an attempt to control inevitable regulation. New Zealand privacy commissioner John Edwards says Facebook can’t be trusted and is a “morally bankrupt pathological liar”. The comments were made in tweets send out by Edwards in response to Facebook CEO Mark Zuckerberg’s interview with the ABC in the US. During the interview, Zuckerberg pushed back against delaying livestream feeds, which have been the focus of a public backlash since the Christchurch attack, saying ‘bad actors’ will try to get around its systems. 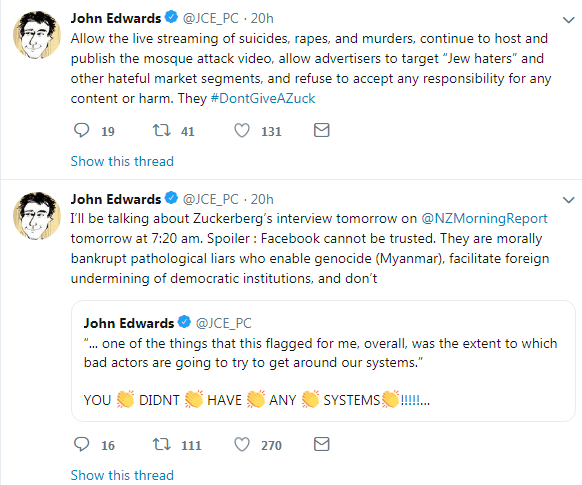 In the now deleted tweets, Edwards accused Facebook of not having systems in place and enabling genocide in Myanmar where Rohingya Muslims were persecuted.